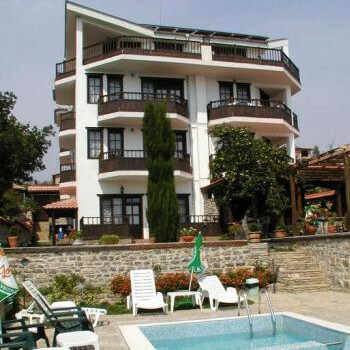 The Hotel Augusta is located in a peaceful area on the hillside in the northern part of Zora Villa. The comforts of this modern hotel and quiet location are superb for anyone looking for a relaxing holiday. hotel very quiet good walk to centre down hill hard work coming home in the heat and uneven road. not suitable for less mobile due to steps. Clean and tidy staff friendly but little english spoken mostly bulgarian visitors. very few children we had pool to ourselves most of time.no entertainment. food was bulgarian cold soup and cold cooked breakfasteveryday as well as meats, cheese, bread, fruit but left uncovered. if we went back we would stay nearer the front in a bigger hotel with some sort of entertainment and something for the children. used the hotel bus to take us to next resort but the taxi was cheaper. airconditioning, tv and fridge in all rooms.